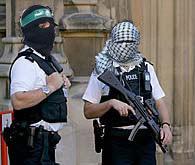 [Via Jihad Watch] "Rukshana Begum...will become the first police officer ever to wear the Muslim hijab, or headscarf, on duty in Cambridgeshire. And she can't wait. When they discovered she was planning to join the police force, Rukshana's parents went mad. Such a thing was, she explains, unheard of for a young Muslim woman. " "Once or twice I had to cancel a duty when family came over," she confesses. "They'd say 'Is your daughter a police? ', like it was something shameful." Yes, it's surely unislamic for a woman to be a police officer. I would imagine the local mosque and Muslim community will share their outrage. She'll probably need a contingent of armed body guards just to walk the streets. "Raised a devout Muslim, who learned how to pray and read the Qur'an at Cambridge's Abu Bakar Siddiq Mosque on Mawson Road, Rukshana recently came to another big decision: from now on, she's going to wear hijab - even when she's on police duty." Since 9/11 and 7/7 she's decided she needs to clearly identify where her allegiances lie. Male officers in balaclavas and shemaghs to follow shortly.